Brighton and Newcastle, two clubs automatically promoted from the Championship last season, go head to head in Premier League on Sunday 24th September, with the Magpies aiming to make it four wins in a row. Who will win at the Amex Stadium? 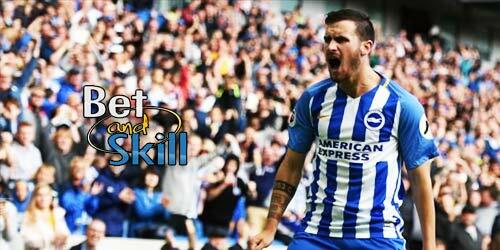 Find here our Brighton vs Newcastle betting preview with predictions, expert tips, probable lineups, team news, best odds, exclusive promotions & no deposit free bets! Brighton put their first points on the board as they followed up a draw at Watford with a 3-1 home win over West Brom, with German midfielder Pascal Gross bagging a double. Anyway, their momentum was halted just over a week ago when they lost at Bournemouth, and the Cherries then inflicted another defeat on the Seagulls when the two teams met in the League Cup in midweek. They have looked sloppy at the back in both games against Bournemouth, but the major problem is they are looking rather toothless in attack right now. Anyway, on the flip side Newcastle have only managed one goal and one win on their travels so far this season. Brighton signed Tim Krul in midweek but he isn't expected to line up against his former club here. Boss Chris Hughton welcomes back captain Bruno, who should return in place of Liam Rosenior at right-back. The likes of Anthony Knockaert, Dale Stephens, Davy Propper and Solly March likely to retain their starts in midfield while Pascal Gross should continue in the central support role behind lone striker Tomer Hemed. As alternatives, Hughton can count on Jose Izquierdo and Glenn Murray. Steve Sidwell, Beram Kayal and Sam Baldock remain out. Newcastle have seen a decent upturn in form in recent weeks, recording three wins in a row in the top flight. Having lost the first two league games against Tottenham (0-2 at home) and Huddersfield (1-0 away), and the League Cup clash against Nottingham Forest, Rafa Benitez's men have started to firing on all cylinders. They beat West Ham (3-0), Swansea (0-1) and Stoke (2-1) in the last three outings and comfortably sit 4th in the league standings. In terms of direct matches, the Magpies came out on top in both Championship fixtures last season. Aleksandar Mitrovic completes his three-match ban this weekend. Rafa Benitez could name an unchanged starting XI for the trip to Brighton as they were not involved in League Cup duty in midweek. Chancel Mbemba returned at left-back last weekend and may keep his place alongside Jamaal Lascelles and Ciaran Clark in central defence. Isaac Hayden and Mikel Merino should continue in central midfield, flanked by wide men Matt Ritchie and Christian Atsu. Up front, Ayoze Perez should support the lone striker Joselu. The likes of Jonjo Shelvey and Dwight Gayle provide back-up options. Florian Lejeune is still receiving treatment, while Paul Dummett and Massadio Haidara are sidelined. Brighton (4-4-1-1): Ryan; Suttner, Bruno, Duffy, Dunk; Stephens, Propper, Knockaert, March; Gross; Hemed. Newcastle (4-4-1-1): Elliot; Clark, Lascelles, Mbemba, Yedlin; Merino, Hayden, Ritchie, Atsu; Perez; Joselu. "Brighton vs Newcastle betting tips, predictions, lineups, odds and free bets (Premier League - 24.9.2017)"